Brussels is a cultivated place with lots of choices. If you want to go for a glamorous night out without spending a fortune on accommodation and food, then Brussels will win over Paris. There is a wide range of choices for cinema-goers in Brussels. Arts films, blockbusters and even a cinema that plays black and white silent movies with a piano if you’re willing to give it a go! The prices of the tickets are reasonable. Seats at some major cinemas are not reserved so turn up early to get the best seats. A wide range of musical influences have developed the Brussels concert scene over the years. Especially popular are jazz and contemporary world music styles from all over the world. Whether you like your concerts in a cosy dim stage at a club or in a modern acoustically perfect studio, you can find them in Brussels and all are equally applauded. Modern opera performances can be found in a number of locations in Brussels. The most famous is perhaps the Brussels opera house The Mint (La Monnaie or de Munt). It is a historical venue where performances once rivalled those in Paris in the 18th century. Orchestras from all over Belgium and Europe play in venues all over Brussels including the popular BOZAR, the Royal Music Conservatory and the Musical Instruments Museum. You will find all of the listings in the weekly Entertainment Listings of Brussels. If you stay for a whole week you will notice Brussels nightlife start on Wednesday nights and will continue straight into Saturday. Gradually keeping people up later and later into the night. From chilled out lounge bars and café bars to more dance orientated places there is a little bit of nightlife to suit everyone. And for the darker side of Brussels, explore the Brussels red light district. Agenda magazine – Free and multilingual listing that is available for pick up at any metro station. They are in the newspaper bins located next to the entrances and exits. Every Wednesday a new issue will appear and it’s absolutely free. Most articles are written in three languages – French, Dutch and English. On the flip side of the magazine is a cinema section dedicated to reviewing films of the week. The Bulletin magazine – This weekly publication is not free but has more articles. It is only in English and aimed at the expatriate crowd. The concerts and theatre listings are thorough and cater for the whole of Belgium so you can go anywhere and know what is going on. The listings include films, music, performing arts, festivals, visual arts, community and miscellaneous happenings in all of Brussels and other cities in Belgium. You won’t be short of anything to do if you appreciate the arts. The Bulletin is available from all newspaper outlets throughout the city. 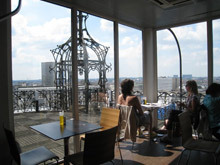 Other sources – If you are still looking for more to do in Brussels to explore the arts scene and upcoming events, then go to the Brussels Tourism Offices in the city centre. These centres have pamphlets and brochures on events in the city.